After starting the day with a four shot lead, Lorena Ochoa fell behind by two then came roaring back to win the Safeway International by two over Suzann Pettersen. It is the tenth career victory for Ochoa and her first of 2007. Jeong Jang and Laura Diaz finished tied for third, a distant eight strokes out of the lead. Lorena stumbled out of the gate with bogeys at 2 and 6 offsetting her birdies at 3 and 7. Pettersen started out like gangbusters with five birdies in the first seven holes to take the lead by one. The two traded pars for several holes until Suzann birdied the short par-4 14th from about a foot away to go up by two. Ochoa matched that one-foot birdie putt on 14 then hit a 95-yard wedge to within a foot to birdie 15 and tie for the lead. Playing one group ahead, Pettersen went to the par-5 18th still tied at -16. While Suzann was in the 18th fairway, Lorena rolled in a ten-footer to take sole possession of the lead. Pettersen’s attempt to make the green in two landed in a bunker just short. She chipped out to about 15 feet but was unable make the birdie. Ochoa surprised me a bit with her second shot on 18. Needing only a par to win and with water looming down the left side, she hit 3-wood trying to reach it in two. Back on 13, she had topped a 3-wood into a fairway bunker and had to scramble for par. This time she came up just a little short but in the short grass, then chipped up and made the putt to close out with birdie. Suzann Pettersen gets this week’s Big Surprise award. The final round of 66 gave her four rounds in the 60s and the second-place finish is the best of her career. Her previous best was third place in the 2003 Chik-Fil-A Championship. A member of the last three European Solheim Cup teams, Suzann has come back from some rather serious back problems and just missed becoming the first Norwegian to win on the LPGA Tour. I also have to give a shout-out to Catriona Matthew, who finished tied for fifth in her first event after giving birth and only two weeks after starting to practice again. In the same vein, Laura Diaz had her best week since she became a mom just over a year ago. 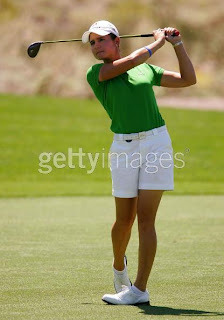 And of course I have to point out that Grace Park finished tied for 16th. If you want to know where Annika Sorenstam finished, you should have been watching TGC last night. Since Cristie Kerr has already endured one Big Disappointment award this year, I decided to give this week’s to Karrie Webb. I sure didn’t see that missed cut coming. Neither player can be in a particularly good frame of mind going into this week’s Kraft Nabisco.